Experience the beautiful and new-restored family farm with personality and tasteful decoration in the original style. 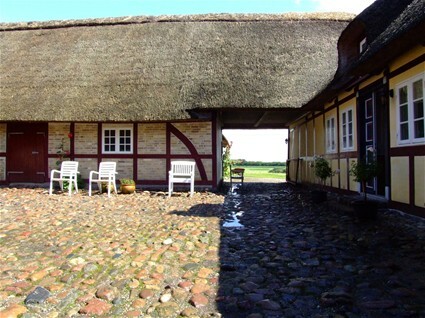 The farm is situated in peaceful surroundings with a view of fields, bogs and the Great Belt, 800 m away from lovely beach and Bøgebjerg Strand Camping. Experience the beautiful Hindsholm at a close range! The farm is an old 4-lengthed farm with a closed yard and a large well-kept garden, which the guests are welcome to use. 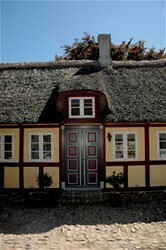 The main house is equipped with four double rooms, which can be rented singular or both together. There is access to two common bathrooms. Large nice living room (TV and fire place). Cosy large kitchen (refridgerator, el-cooker and dish-washer). Charming smaller dining room with tea kitchen (TV, refridgerator and el-cooker). 1/2 price for children under the age of 12, who sleeps in the parent's room. Children under the age of 4 are free. Discount when staying at least 3 days. The prices are including towels and bed linen. Payment by arrival in cash (no credit card). Open in the summer time or as agreed.